Panasonic has produced a rather excellent pair of affordable headphones in the RP-HTX80. The fantastic looks offer something genuinely different to the myriad other headphone companies, while the sound is easy listening as can be. Commuters and frequent flyers may demand the very best noise-cancelling headphones with the plushest materials on the planet, but what if you could get great audio performance from a simpler and comfy pair of cans that look effortlessly cool? That's exactly where the Panasonic RP-HTX80B fits in. These over-ear cans don't have all the current top-end features - there's no noise-cancelling or aptX, for example - but what they do deliver is totally wireless performance at an attractive price. In a sea of black, white or silver, it can be tricky to find more exciting, colourful headphones. Panasonic clearly wanted to stand out from the crowd when designing the RP-HTX80B, which sport a fresh yet retro look that's like little else on the market. Our review pair came in a rather fetching Sangria (red), but are also available in other colours. We think all the options look great, with their curved ear cups and pads, hint of metal used for the Panasonic logo, and short braided cables. The earcups don't fold away for portability, but they do have some flex in them so they can contour to your face. The HTX80B is incredibly comfortable to wear, thanks to a lightweight build, soft foam pads on the earcups and headband that has as much flexibility as a world-class gymnast. On the right earcup you'll find the standard assortment of control buttons: play/pause, skip forward/back, and power. What you won't find is a 3.5mm auxiliary socket, as there's no wired option at all. However, Panasonic has gifted these cans with an incredibly generous 25 hour battery life to make up for lack of wired support. And if you do run out of juice then you can get two hours worth of battery from a 15 minute charge. The HTX80B feature 40mm dynamic drivers, which are shared by most other over-ear headphone models. Sound is generally well balanced, clear and detailed. However, we feel there's a slight lacking in the bass department. The low-end on offer could do with little more oomph to really spice up the tunes. It's all personal preference, though, as some will prefer this more neutral soundscape. What we particularly love about the HTX80B is the mid and high-end performance. Vocals in particular come through clearly, creating a pleasing sound. It's not too warm, not too bright, but finds its ideal sweet spot in the middle. While there's no noise-cancellation tech, the Panasonic HTX80B provide a tight, isolated grip on the head - so do a good job of keeping external noise at bay. Overall, for the £100 asking price, we certainly don't feel short-changed on the features and sound front. However, there's not a big dollop of bass at the low-end, while the lack of any wired may restrict some. Sure, the majority of smartphones are ditching the 3.5mm connection, but the back-up option would be nice. We would also appreciate an included carry case of some kind, but considering the high build quality, we'd be pretty happy putting the HTX80 loose in our bag. But not for long, as we'd much rather have these cans hugging our head and delivering the tunes. 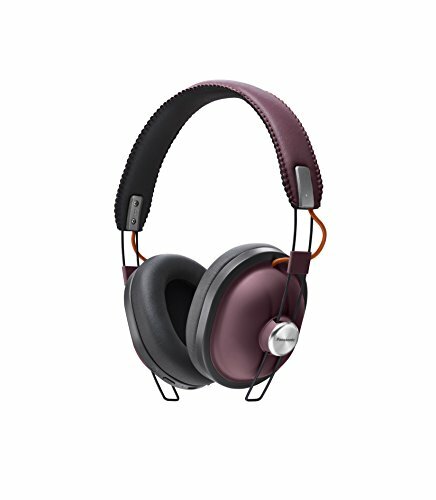 If you're an iPhone owner and you want a wired pair of headphones that deliver a tremendously good all-round sound, look no further than the Philips Fidelio M2L. Incredibly well-built, these cans offer up a well-balanced sound and they don't cost the earth either. If it's gorgeous good looks you're after from a pair of headphones, things don't get much better looking than the Bowers & Wilkins PX. Sure, the cost is much higher than the Panasonic, but the PX is packed full of tech, including excellent active noise-cancellation.